It fascinating to read Daniel Kahneman’s writing on Risk and Heuristics and human psychology. I have recommended his book “Thinking Fast and Slow”, the picture to the right is from the book on how we react to Gains vs. Losses and how our decision making is influenced based on the baseline from where we start. 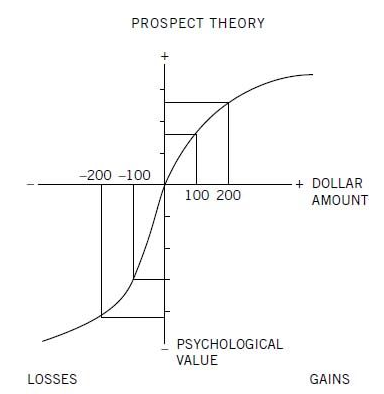 Prospect Theory was an improvement on a previous model developed by Bernoulli, in which states of wealth are the carriers of value, whereas Prospect Theory has psychological value of gains and losses. The graph basically depicts the “Loss Aversion” and diminishing sensitivity for both gains and losses. The two curves are not symmetrical ie the slope of the curves change abruptly at the reference point, which indicates the responses to losses is stronger than the responses to corresponding gains. This could explain the heard behavior we have in the stock market when the market starts going down everyone runs to the exit at the same time thereby causing a collapse. When forecasting the outcomes of risky projects, executives too easily fall victim to the planning fallacy. In its grip, they make decisions based on delusional optimism rather than on a rational weighting of gains, losses, and probabilities. They overestimate benefits and underestimate costs. They spin scenarios of success while overlooking the potential for mistakes and miscalculations. As a result, they pursue initiatives that are unlikely to come in on budget or on time or to deliver the expected returns- or even to be completed. In this view, people often (but not always) take on risky projects because tehy are overly optimistic about the odds they face. It probably contributes to an explanation on why people litigate, why they start wars, and why they open small businesses. The best way to solve the above fallacy is to dedicate oneself to the truth, I wrote about it and I have also written about the motivation for being an entrepreneur. Most of the successful entrepreneurs who I have met, typically are not doing this with economic benefits in mind and this goes for the successful VCs as well. Being optimistic and pushing forward when all the odds are stacked up against you is the hallmark of Entrepreneurship but that should not lead to telling lies to yourself.